This is the sixteenth part of the Free to Play Journeyman hearthstone Guide Series. Be sure to check out the other articles in the series here: Part 1, Part 2, Part 3, Part 4, Part 5, Part 6, Part 7, Part 8, Part 9,Part 10, Part 11, Part 12, Part 13, Part 14 and Part 15.
, neither of which I owned. Therefore I faced much the same dilemma of building similar decks without their key cards and losing the mirror by default; a poor meta-game decision. If you’re not going to play the best deck (and we FTPers often cannot build the best deck), then either play a deck that beats the best deck or at least play a deck that beats others using the same strategy or class. in the battle for the early board, while the latter has a good chance of knocking off a point of health from the typical 3 health or bust the shields of other early game DS minions. I went into the think tank, considered my 3500 dust just sitting waiting to be spent, and made some changes. was where it was at! At 1800 dust, the deck is actually cheaper to craft than its predecessor. As is normal with this kind of deck, control of the board is paramount. Against the aggro player, especially Zoolock, Shaman has an unusual advantage; they can’t let you keep a totem on the board. So they are forced to waste their early face damage on your minions in an effort to keep the board themselves. They are also forced to trade against the deck’s early plays, all of which have at least 3 health, except Argent Squire which is generally a two-for-one unless immediately killed by larger minions (which in taking a point of damage usually put themselves within reach of being out-valued in a later trade). Once the aggro player loses the board it’s only a matter of time before one can wrap the game up, usually with the Valiant creating an increasingly powerful board each turn. to perform double duty). Against control it is sometimes good to not waste Rockbiters as well – you will eventually draw your Doomhammer.
. If there is some other minion giving you grief it is often better to discover other ways of removing it rather than wasting the Hex and then getting crushed by its expected target that the opponent had in hand all along while waiting for you to play your Hex! 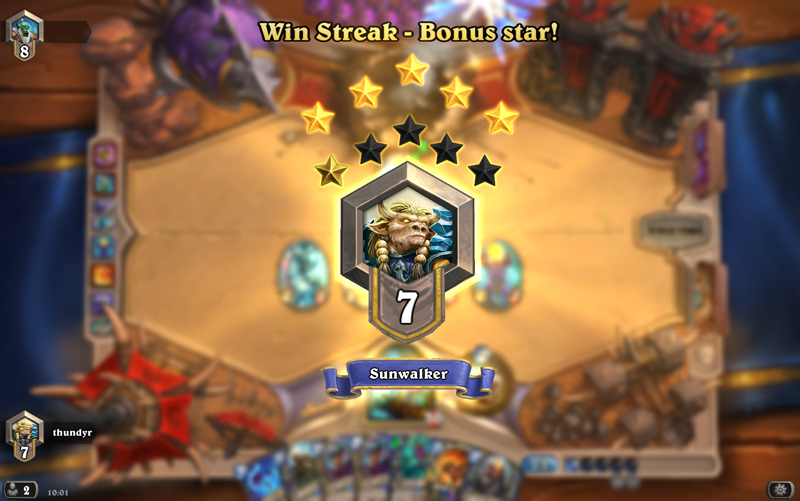 There followed a 6 game win streak to reach my highest ever US rank of 9; cue much cheering! I then rolled a 5 wins Shaman/Mage daily, and suited up with this deck. Could I get higher than 9? 5-0 later and I had hit rank 7. Not bad for FTP! Surely, your Honour, with an 11 game win streak we can conclude that the deck fundamentally works? It is interesting that the deck built is, but for the aforementioned Fire Elementals, card for card the same as what the dominant midrange Shaman build would later become. Well done, team! Of course, the lucrative target of a golden Epic card in the Rank 5 end of season reward beckons, but I’m not entirely convinced I can get there just yet. And yet, that’s not how I like to roll. Good as the deck apparently is, an FTPer playing a Wallet Paladin seems … I dunno, wrong somehow. Or perhaps this is the pinnacle of success – spending no cash but (almost) being able to build a legend-rank deck costing around 12,000 dust to craft? My calm is disturbed, brothers. Give me your thoughts on this matter in the comments, please! ← N’zoth Paladin: By The Holy Light!